Synopsis (from the publisher): Pulitzer Prize–winning investigative journalist Tom Sagan has written hard-hitting articles from hot spots around the world. But when a controversial report from a war-torn region is exposed as a fraud, his professional reputation crashes and burns. Now he lives in virtual exile—haunted by bad decisions and the shocking truth he can never prove: that his downfall was a deliberate act of sabotage by an unknown enemy. But before Sagan can end his torment with the squeeze of a trigger, fate intervenes in the form of an enigmatic stranger with a request that cannot be ignored. Zachariah Simon has the look of a scholar, the soul of a scoundrel, and the zeal of a fanatic. He also has Tom Sagan's estranged daughter at his mercy. Simon desperately wants something only Sagan can supply: the key to a 500-year-old mystery, a treasure with explosive political significance in the modern world. For both Simon and Sagan the stakes are high, the goal intensely personal, the consequences of opposing either man potentially catastrophic. On a perilous quest from Florida to Vienna to Prague and finally to the mountains of Jamaica, the two men square off in a dangerous game. 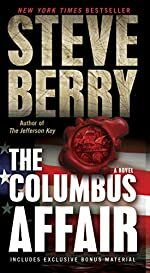 Along the way, both of their lives will be altered—and everything we know about Christopher Columbus will change.